Well done, Scandanavia…Again! All of our best travel experiences have been to Scandanavia and this is the best one yet! 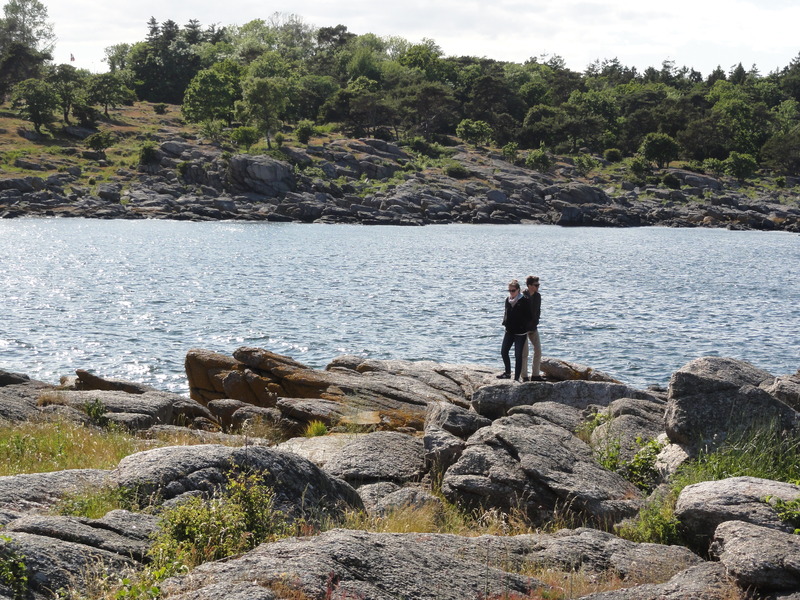 The island of Bornholm is a small island in the Baltic sea, about 1.5 hours by ferry from Sweden and Germany. So it’s really in the middle there. There’s something so special about these island communities that are not easily accessed (think Vancouver Island). Just far enough to have its own identity and just large enough to have a culture and flourishing community, Bornholm is full of wonderful people, sweeping vistas, white sandy beaches, dense forests, and plenty of smoked meats and fish to go around. What’s even better is that it’s probably not on your list of places to go, which means a more affordable and non-touristy vacation for us. In fact, when we were waiting out a rainstorm at a hot dog kiosk this guy said, “Are you American?! I think we had Americans here before…How did you even find this place?” Yes, it was awesome. Red bikes. We rented bikes for the entire week and spent every day biking for hours and hours. 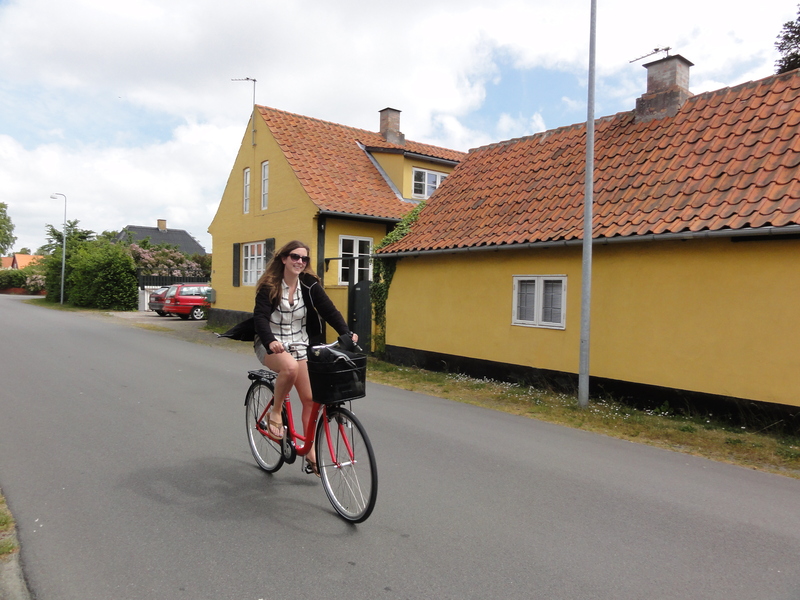 We pedaled through rolling hills overlooking the sea, through old growth forests with hidden deer, along the coast, past windmills and round churches, and through quaint towns. Even though we were barely able to walk every night, there was something really satisfying about knowing we had spent the whole day getting around without a car. Plus, coasting down those hills at sunset was breath taking! Orange fire. We rented a small cabin in the forest at Balka Beach from an AirB&B host. Each morning I was the first to wake up and I would go out on the porch and sit in the sun with my tea journaling. White/pied wagtails and a willow warbler visited me every morning. Don’t be deceived by the pictures though: it was cold! At night we had roaring fires, so hot we needed to open the windows! Andrew and Scott played chess by the fire and it was super Hygge. Yellow rocks. One of the days we went to Svaneke, a little harbor town with beautiful coastline that you can walk along. After a nice meal at the Rogeri, we climbed on the rocks, basked in the sun, and dreamed of opening a commune on this island! Green hillsides. The whole island of Bornholm was lush and green, providing rolling green hillsides. When you’re on a bike, it seems like everything is uphill, but with the surrounding scenery, it was magical! The best day on bikes was this day (pictured here). We rode for hours through an ancient forest to the center of the island where there is a farmhouse. There is a restaurant where you can order, you guessed it, smoked meats. While we were eating, the owner came out to talk to us and explained his process of meat smoking. What an amazing place, you can read about it here. Blue sea. This was not at all what I was expecting. I thought the Baltic Sea would look grey and foreboding. However, it looks clear, blue, and tropical. The beaches have white sand. 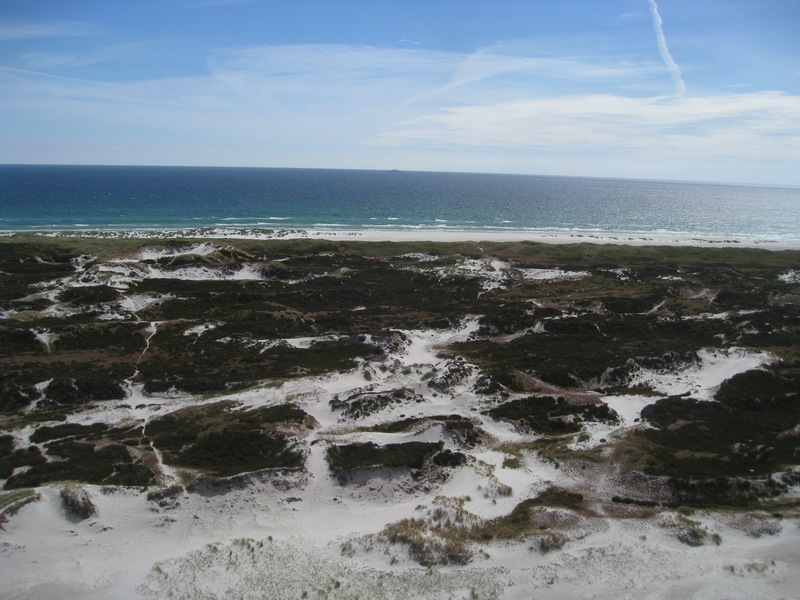 In fact, if you have an hour glass, chances are the sand inside of it comes from Bornholm. It’s so soft and clean. We biked to Dueodde beach (we just went with “dude” beach) and found a sand dune to lie in to protect us from the wind. Purple skies. One of the coolest places to watch birds was along the bike path leading into town from our cabin. 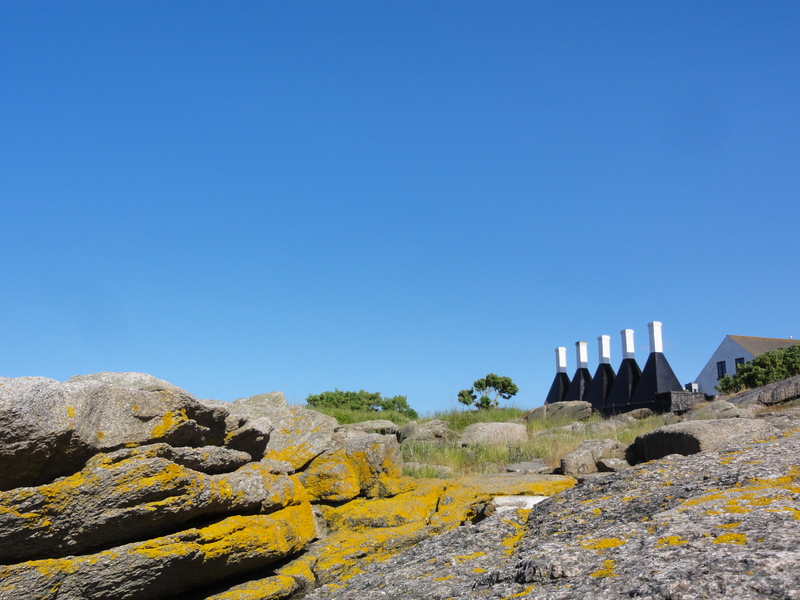 There were always at least three cormorants drying their wings on the rocks offshore. We always happened to be biking by near twilight when the sky was purply and the water was calm, reflecting the light. I know, it doesn’t look purple in this picture. In case you’re not convinced yet, click on the gallery below to see more pictures of our amazing trip. Note: if the photos seem better quality to you this time it’s because there were all taken by Scott Hardingham. Andrew and I need to get a better camera! After waiting out the rain for an hour, we finally did our hike! Here is the farm we ate at!